Hairy pottery seaweed. Left: Photo by Thalia Christou. Right: photo taken through a hand lens by Julia Fisher, showing the pincer-like branch tips. 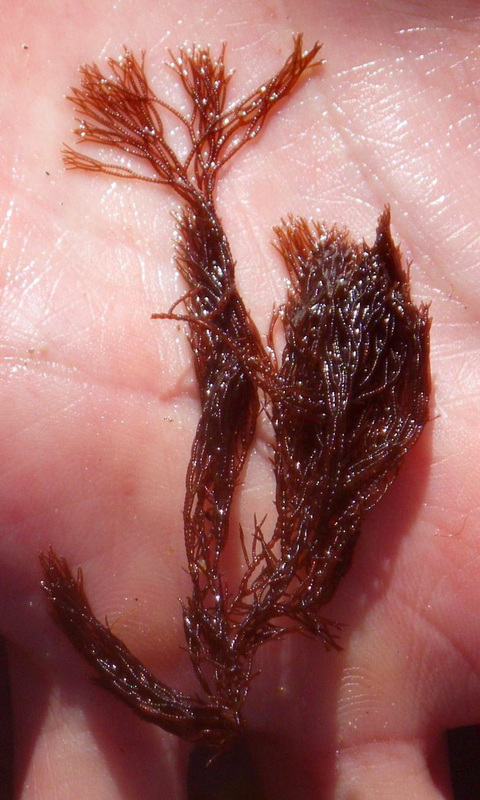 Hairy pottery seaweed is a delicate red alga with irregular or dichotomous branching and branch tips that are split to resemble crab pincers. The arrangement of small cells over a large central axial cell creates dark and light banding along branches when held up to light. Ceramium species can be difficult to differentiate - usually microscopic examination is required. This species gets to 18 cm long and has many short side branches. Hairy pottery seaweed grows on rock as well as epiphytically on other seaweeds in the mid- to low-intertidal and subtidal to a depth of 10 m. It is commonly found in shallow tide pools. Its range extends from the Alaska Peninsula south to northern Mexico. 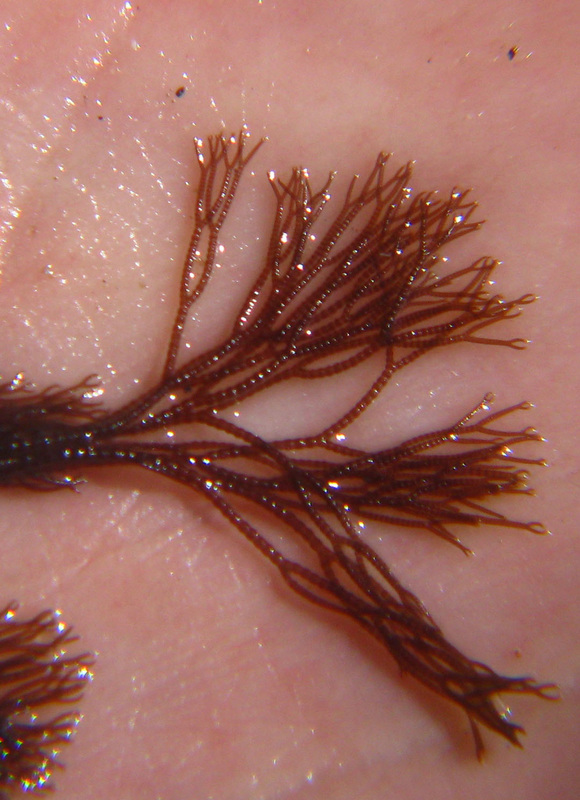 All seven Ceramium species found in the Pacific Northwest have forcipate (pincer-like) branch tips and banded branches, though approximately half of these species are rare or only found in the subtidal. While identification can be narrowed down by size (most species are less than 2 cm long) and habitat, microscopic examination is usually required to definitively identify Ceramium species. Lindberg, M. and Lindstrom, S. (2010). Ceramium pacificum. Seaweeds of Alaska. Accessed 02/12/2014. O'Clair, R. and Lindstrom, S. Ceramium pacificum (Collins) Kylin. In Klinkenberg, Brian. (Ed.). E-Flora BC: Electronic Atlas of the Plants of British Columbia. Lab for Advanced Spatial Analysis, Department of Geography, University of British Columbia, Vancouver. Accessed 02/12/2014.